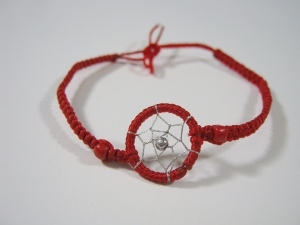 These dreamcatcher string bracelets are handmade by the Inca of Peru and comes in various colors. The metal rings are 0.5" to 0.75" (1.3 to 1.9 cm) in diameter. The bracelet is 6" (15.2 cm) long with 3" (7.6 cm) long ends for tying. Two bracelets weigh 2.8 grams.